Add the JSA Crossover Pack to any DC Comics Deck-building Game to play as the original DC Universe Super Hero team and take on their most infamous foes! 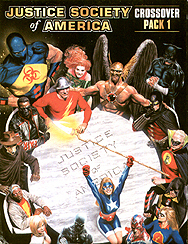 Doctor Fate, The Flash (Jay Garrick), Green Lantern (Alan Scott), Mister Terrific, Power Girl, Stargirl and Wildcat! All-new Super-Villains, Equipment, Hero, Villain, Super Power, and Location Cards! Contents: 7 Oversized Super Hero Cards, 18 Game Cards, Rules. A copy of any DC Comics Deck-building Game is required to play.